Tuesday, the First of July, 1651. A LETTER from Major General Lambert, from Edenburgh, the Twenty-fourth of June 1651 was this Day read. 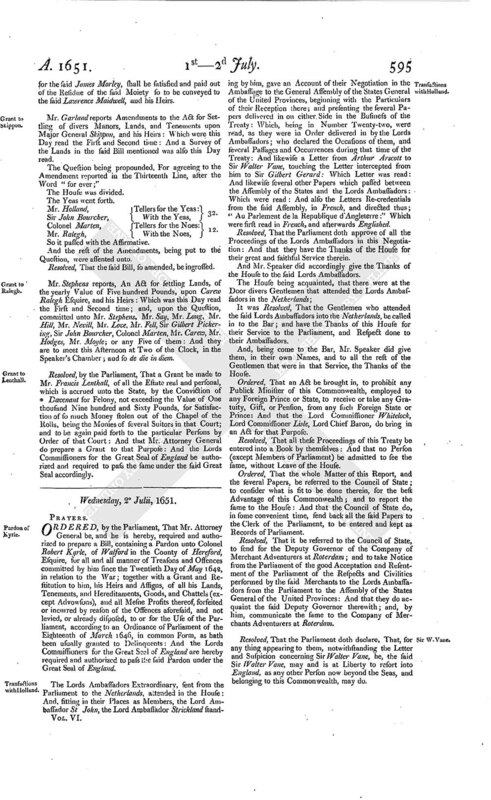 Ordered, That it be referred to the Council of State, to give Power and Instructions to such Persons, within the several and particular Counties in England and Wales, as they shall think fit, for preserving the Peace of the Commonwealth, and preventing all Tumults, Insurrections, and Invasions. A Letter from the Commissioners of the Parliament in Ireland, from Dublyn, of the Twenty-fifth of June 1651; a Letter from Colonel Ludlow, from Locreay, of the Twelfth Day of June 1651; and a Letter from John Reynolds, from Athlone in Lemster, June the Twentieth, 1651; and a Letter from Colonel John Hewson, from Athlone, the Nineteenth of June 1651; and a Letter from Mr. Wm. Basill, from Dublyn, of the Three-and-twentieth of June 1651; and a Letter from the Lord Brohall, from Castle Lyons, of the Seventh of June 1651; were all this Day read. Ordered, That the Bill touching the Lord Broghill be brought in on Thursday-fortnight: And that Mr. Speaker do put the House in mind thereof. The House this Day resumed the Debate upon the Delinquents Bill. Resolved, That the Name of Philip Earl of Chesterfield be inserted into this Bill, for his Lands to be sold. Resolved, That the Name of John Denham, late of Egham, in the County of Surrey, Esquire, Son and Heir of the late Baron Denham, be inserted into this Bill, for his Lands to be sold. Resolved, That the Name of Sir Robert Hatton, of *, be inserted into this Bill, for his Lands to . . sold. Resolved, That the Name of Sir Thomas Riddle the younger, *, be inserted into this Bill, for his Lands to be sold. Resolved, That the Name of Sir John Somersett, of Duresme, be inserted into this Bill, for his Lands to be sold. Resolved, That Roger Bodenham, of Rotheras in the County of Hereford, be inserted into this Bill, for his Lands to be sold. Resolved, That the Lord Brudenell, of *, be inserted into this Bill, for his Lands to be sold. Resolved, That Sir Henry Bedingfield, of *, be inserted into this Bill, for his Lands to be sold. Resolved, That Thomas Beckwith, of Beverley, *, be inserted into this Bill, for his Lands to be sold. Resolved, That Henry Percy, Esquire, of *, be inserted into this Bill, for his Lands to be sold. Resolved, That Sir Philip Constable, of Everingham in the County of Yorke, Knight, be inserted into this Bill, for his Lands to be sold. Resolved, That Rowland Ayre, of Hassop in the County of Derby, Esquire, be inserted into this Bill, for his Lands to be sold. Resolved, That Peter Gifford, of *, be inserted into this Bill, for his Lands to be sold. Resolved, That John Gifford, of Wolverhampton in the County of *, be inserted into this Bill, for his Lands to be sold. Resolved, That * Hamilton, Brother to James late Earl of Cambridge, be inserted into this Bill, for his Lands to be sold. Resolved, That * Earl of Lowderdale be inserted into this Bill, for his Lands to be sold. Resolved, That Sir Arthure Aston, of *, Knight, be inserted into this Bill, for his Lands to be sold. Resolved, That Cuthbert Morley, of *, Esquire, be inserted into this Bill, for his Lands to be sold. Ordered, That the Contractors named in the Act soSale of the Estates of several Delinquents be authorized and required to contract with James Nelthorpe Esquire, for the Purchase of such Part of the Estate of Thomas Beckwith, a Papist in Arms (whose Estate is hereby to be sold), as is now rented by the said James Nelthorpe, at Sixty Pounds per Annum; and make Sale thereof unto the said James Nelthorpe: And that the Trustees in the said Act named be authorized and required to convey the same according to such Sale: And that the Treasurers, Register Accomptant, and other the Officers for Sale of the said Lands, whom it may concern, be authorized and required to allow unto the said James Nelthorp, out of the said Purchase Money, the Sum of Two hundred Pounds, due by Judgment from the said Thomas Bechwith to Jane Fish Widow, together with Interest for the same. A Proviso was tendered to this Act, in these Words; "Provided always, and be it Enacted, by this present Parliament, That One Moiety, in Severalty of all and regular the Manors, Lands, Tenements, and Hereditaments whatsoever, of Cuthbert Morley, in this Act named, shall, by the Trustees herein before named, be conveyed and assured unto Lawrence Maydwell Esquire, and to his Heirs, the Discoverer of the said Estate, or to such Person or Persons, and to his and their Heirs, as he shall nominate and appoint, as a Recompence for the said Discovery; any thing in these Presents contained to the contrary notwithstanding: And that the other Moiety of the Land, Tenements, and Hereditaments, be by them sold and disposed of to and for the Use, Benefit, and Beheef, of the Committee of the Navy, to be by them employed in and about the Navy, in such Manner as they shall direct and appoint; any thing herein to the contrary notwithstanding:" which was this Day read the First and Second time; and, upon the Question, assented unto; and ordered to be Part of the Bill. Ordered, That, after the Debts of James Morley Esquire, deceased, for which Lawrence Maidwell Esquire, named in the Proviso to the Bill for Sale of Delinquents Estates, shall be satisfied and discharged, out of the Moiety of the Estate of Cuthbert Morley Esquire, Son and Heir of the said James Morley, appointed, by the said Proviso, to be conveyed to the said Lawrence Maidwell, and his Heirs, the several Debts of the said James Morley, due to John Goodwin Esquire, Lawrence Whittacre Esquire, Elizabeth Howard Widow, and Dame An Bridges Widow, or for which they, or either of them, stand bound for the said James Morley, shall be satisfied and paid out of the Residue of the said Moiety so to be conveyed to the said Lawrence Maidwell, and his Heirs. Mr. Garland reports Amendments to the Act for Settling of divers Manors, Lands, and Tenements upon Major General Skippon, and his Heirs: Which were this Day read the First and Second time: And a Survey of the Lands in the said Bill mentioned was also this Day read. The Question being propounded, For agreeing to the Amendment reported in the Thirteenth Line, after the Word "for ever;"
Mr. Holland, Tellers for the Yeas: 32. Colonel Marten, Tellers for the Noes: 12. And the rest of the Amendments, being put to the Question, were assented unto. Resolved, That the said Bill, so amended, be ingrossed. Mr. Stephens reports, An Act for settling Lands, of the yearly Value of Five hundred Pounds, upon Carew Ralegh Esquire, and his Heirs: Which was this Day read the First and Second time; and, upon the Question, committed unto Mr. Stephens, Mr. Say, Mr. Long, Mr. Hill, Mr. Nevill, Mr. Love, Mr. Fell, Sir Gilbert Pickering, Sir John Bourcher, Colonel Marten, Mr. Carew, Mr. Hodges, Mr. Moyle; or any Five of them: And they are to meet this Afternoon at Two of the Clock, in the Speaker's Chamber; and so de die in diem. 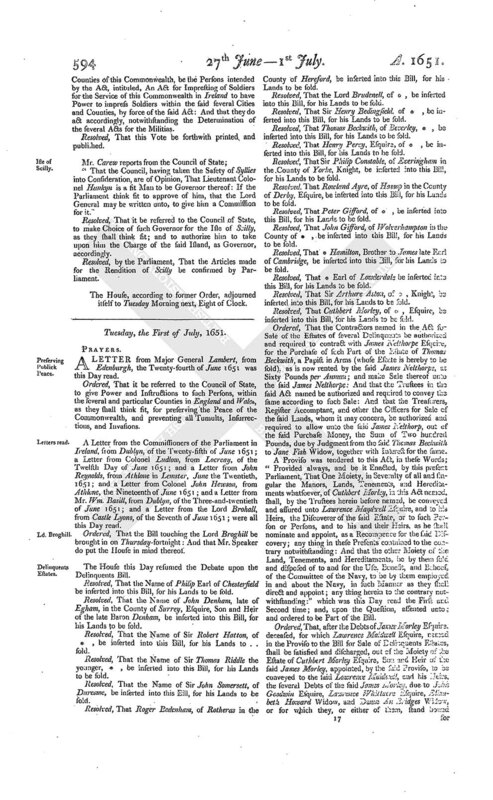 Resolved, by the Parliament, That a Grant be made to Mr. Francis Lenthall, of all the Estate real and personal, which is accrued unto the State, by the Conviction of * Davenant for Felony, not exceeding the Value of One thousand Nine hundred and Sixty Pounds, for Satisfaction of so much Money stolen out of the Chapel of the Rolls, being the Monies of several Suitors in that Court; and to be again paid forth to the particular Persons by Order of that Court: And that Mr. Attorney General do prepare a Graut to that Purpose: And the Lords Commissioners for the Great Seal of England be authorized and required to pass the same under the said Great Seal accordingly.